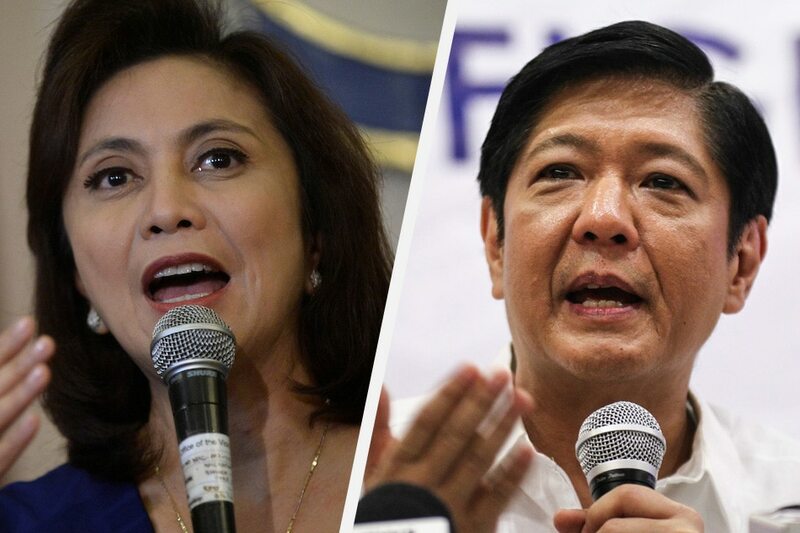 MANILA- Former senator and defeated vice-presidential candidate Ferdinand "Bongbong" Marcos, Jr. has asked the Supreme Court (SC), sitting as the Presidential Electoral Tribunal (PET), to dismiss the counter-protest of Vice-President Leni Robredo in connection with the May 2016 elections. 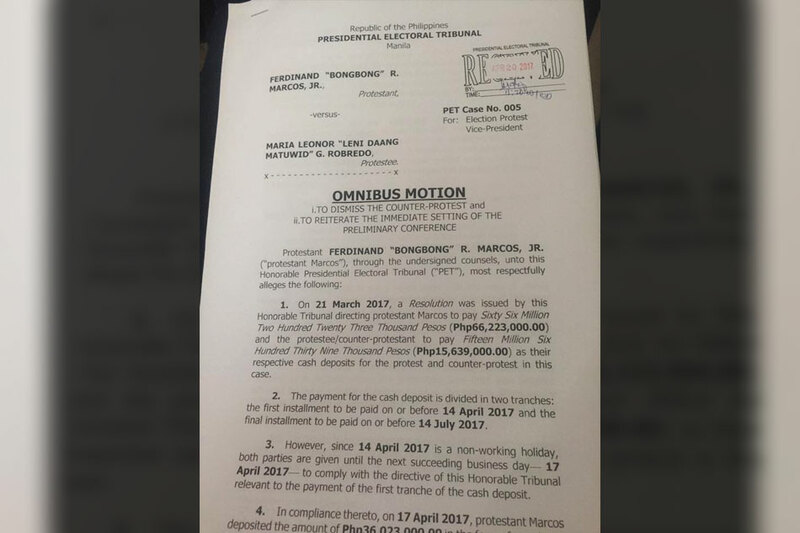 In a 6-page omnibus motion received by the high court on Thursday, Marcos, who has a pending election protest against Robredo, argued that the latter failed to comply with the tribunal's order last March 21 for payment of the first installment required of both parties, the deadline of which was on Monday, April 17. Marcos, for his part, personally saw to the payment on Monday of the P36.02-million first cash deposit required of him by the PET. The payments are for the retrieval of poll materials, consisting of election documents and ballot boxes, subject of their respective protests. The amounts were based on the P500 per precinct computation. "[T]he protestee/counter-protestant (Robredo) did not pay the required initial installment of the cash deposit in the amount of eight million pesos (P8-million) by 17 April 2017, she opted instead to file a manifestation with urgent ex-parte omnibus motion (1) for clarification; and (2) reconsideration of the resolution dated 21 March 2017. "In view of the failure on the part of the protestee/counter-protestant to pay the first tranche of the cash deposit for her counter-protest within the deadline set by this honorable tribunal, protestant Marcos is now constrained to move for the immediate dismissal of the counter-protest in accordance with Rule 34 of the 2010 Rules of the Presidential Electoral Tribunal," Marcos' motion read. counter-protest, or take such action as it may deem equitable under the circumstances." Marcos cited the cases of Perla Garcia, et al. vs. House of Representatives Electoral Tribunal (HRET) and Rep. Harry Angping; and Bienvenido William D. LLoren vs. Commission on Elections (Comelec) and Rogelio Pua, Jr., where the high court upheld the dismissal of the protests "for failure to make the required cash deposit within the time prescribed." In her plea for deferment of payment, Robredo said it is "premature" for her to make the necessary payment for the two tranches since this "is not yet necessary pending determination of the merits of [Marcos'] election protest." She also cited the pendency of her motion for reconsideration, which seeks a reversal of the PET's ruling finding Marcos' protest sufficient in form and substance. In his motion, Marcos accused Robredo's camp of delaying the process. "The filing of [Robredo's] manifestation with urgent ex-parte omnibus motion cannot excuse Robredo from the payment of the required cash deposit since the same is obviously dilatory. "Robredo's intention to further delay the proceedings in this case is evident from the arguments raised in her latest submission. Protestant Marcos finds it quite ironic that Robredo would ask for the deferment of the payment of her cash deposit even though she had already expressed her conformity and willingness to pay the same in her [manifestation]," Marcos' motion read. Marcos also moved for the setting of preliminary conference on his protest, as mandated by Rule 29 of the PET Rules. His protest covers 39,221 clustered precincts or 132,446 precincts, while Robredo's counter-protest covers 8,042 clustered precincts or 31,278 precincts. Marcos lost to Robredo by merely 263,473 votes, making the margin of votes between the two the slimmest in recent history.